Candle Aire Electric Warmers by Candle Warmers. Create a memorable setting with the electric Candle Aire Warmers by Candle Warmers. 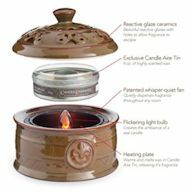 Let it warm and release your favorite Candle Aire fragrance through out your home with it’s patented whisper quiet fan. The Candle Aire features a flickering light bulb that creates a flame-like image.